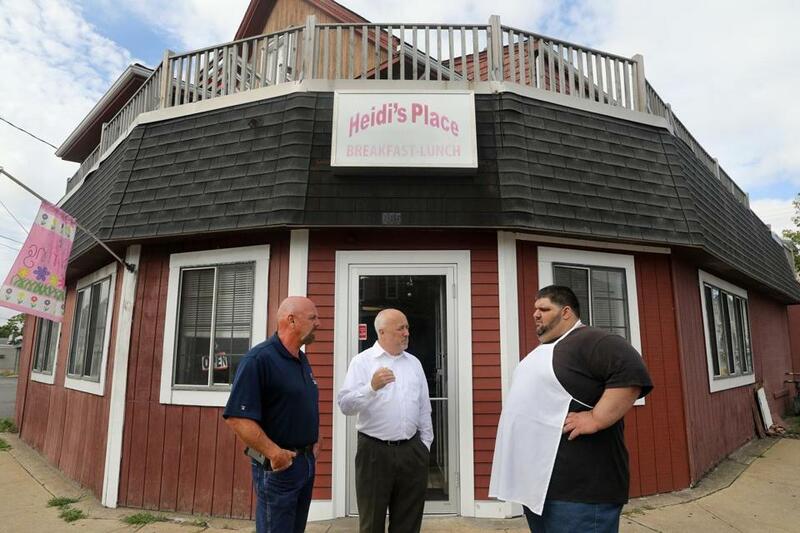 Heidi’s Place owner Alex Kosmidis (right) talked about traffic safety with Brockton Mayor Bill Carpenter (center) and DPW Commissioner Larry Rowley. 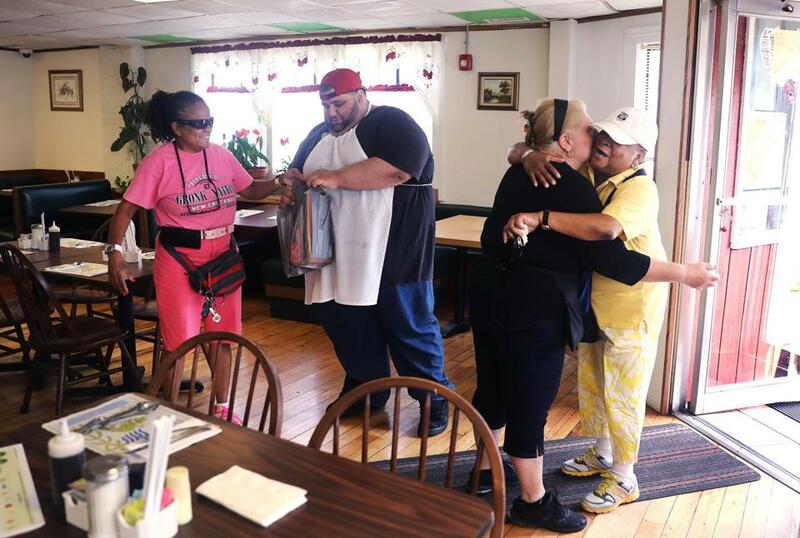 BROCKTON — Maggie Kosmidis spent last Sunday morning serving coffee and chatting with regulars at Heidi’s Place, the homey breakfast-and-lunch spot she and her son have co-owned for the past eight years. Midafternoon, she closed up and walked home. Then her phone rang. For the third time in a little over two years, a car had crashed into Heidi’s Place, on the corner of Warren Avenue and Florence Street. This time, the driver was a tenant in a nearby apartment building. His landlord was calling to tell Kosmidis the bad news. “I said to myself, ‘not again,’” said Kosmidis, 62, a few days later, standing behind the restaurant’s wrap-around counter. After the second crash last year, Kosmidis’ son Alex, 32, went so far as to ask if the city could install guardrails or some other kind of barricade on the sidewalk outside. Officials say they can’t; that would create a barrier for people with disabilities. But now the mayor is promising to install two more stop signs to underscore their meaning to motorists. “I’m hoping that this time, third time’s a charm,” Alex Kosmidis said. Kosmidis and his mother, Maggie (center), greeted customers Carol E. Dawkins (left) and her wife, Rosie L. Sanders. Cars have hit Heidi’s three times in just over two years. 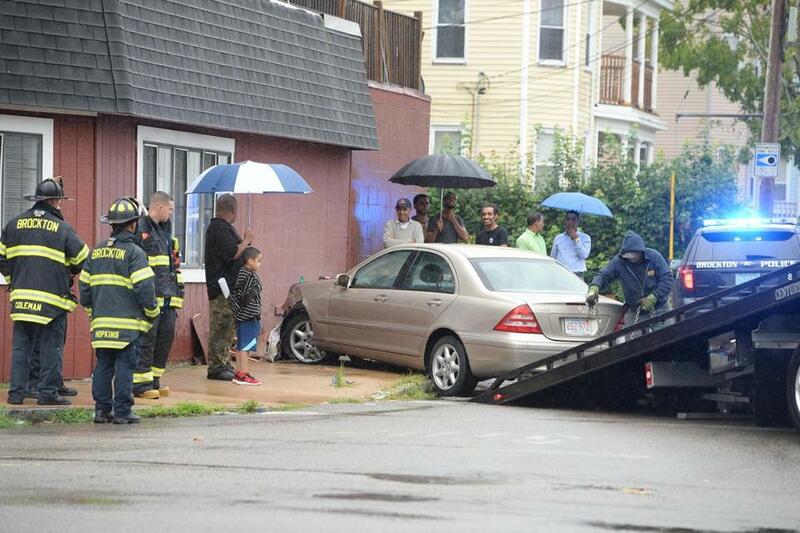 In recent years, Brockton has wrestled with how to keep its roads — and sidewalks — safe. In 2014, nine pedestrians were killed by cars in Brockton, a city of 95,000 or so, two more than in the city of Boston that year. Determined to take action, Mayor Bill Carpenter created a pedestrian and bicyclist safety plan to find ways to address the issue, such as installing new crosswalk markers and adding more traffic enforcement. These efforts have helped, but there have still been a number of crash-related fatalities and injuries in the years since. In a three-day period last year, three pedestrians were struck by vehicles, two fatally, according to The Enterprise. Heidi’s Place sits in a vulnerable spot, with just a thin strip of sidewalk separating it from the busy nearby intersection. There are stop signs in two of the four directions of traffic. A neighborhood staple started by a Greek immigrant family more than 40 years ago, Heidi’s is known for its breakfast classics: sausage, eggs, and French toast, prepared with “a touch of Greek” love, Maggie Kosmidis said. Old-fashioned white linen curtains adorned with embroidered cherries line the windows. Photos of family, friends, and food cover the back wall. Kyle Hurd, a regular who lives nearby, said many careless or impatient drivers will cross into the intersection and idle there when traffic builds up, making it difficult for cars to pass through. A car crashed into Heidi's Place on Aug. 12. Hurd said it’s gotten so bad that he now chooses to drive around the intersection and avoid it altogether. The first crash happened on the night of July 4, 2016, when a driver plowed into the restaurant’s front door, according to police reports. The Kosmidises had to close for a month as they waited for their insurance claim to process. Repairs were made during off-hours after the second crash, which occurred on an August evening last year when a driver lost control as she attempted to cross the intersection. The driver collided with another vehicle and drove into the restaurant wall, a few feet from the previous incident. Kosmidis was initially relieved last weekend when she raced to the scene with her son: No one had been hurt, and the damage wasn’t as bad as she expected. The car had knocked over a stop sign before crashing into the side of the restaurant, leaving behind a hole in the exterior a few feet from the building’s gas pipes. “If that stop sign wasn’t there, they would have gone straight for the gas,” Maggie Kosmidis said. Her son said that he asked the mayor’s office for help making the family restaurant safer after the second crash. The mayor told him that he would enlist the help of the Department of Public Works and the traffic commission. The younger Kosmidis said he never heard back after that. Carpenter said the DPW saw few options because of the building’s location and proximity to the street. Alex Kosmidis and his mother, who has worked at the restaurant since 2001, both say that before the crash in 2016, they’d never heard of a car crashing into the building. Last week, Alex decided to ask for guardrails again. But when a sympathetic Carpenter dropped by Heidi’s Place last week to meet with the owners, he told him that guardrails wouldn’t work. Instead, the mayor asked that two additional stop signs be installed next to the existing ones on Florence Street to increase visibility. He has also requested that all the white painted lines at the intersection be repainted, and he asked the chief of police to place additional traffic enforcement in the area. “We’re hoping that some high visibility enforcement may help with some of the drivers’ habits as they drive through that intersection,” Carpenter said. Brockton councilor-at-large and former mayor Winthrop Farwell Jr. said he’s concerned about the number of crashes in the city. 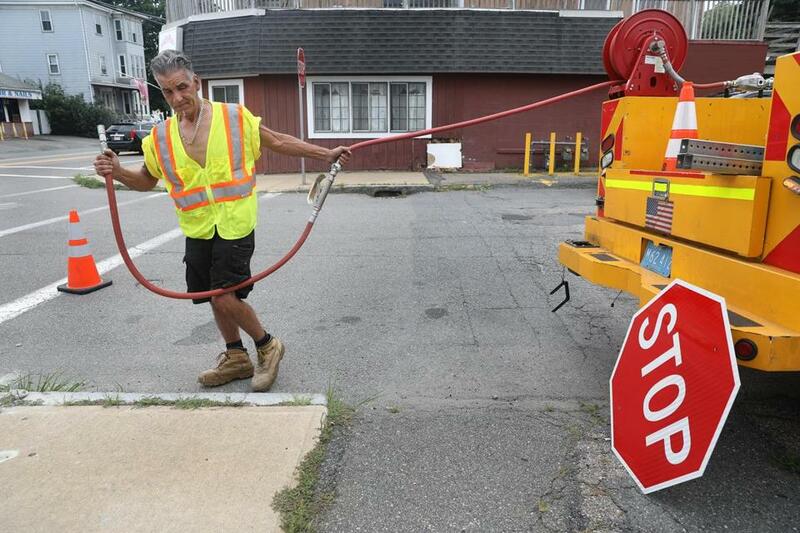 Highway department worker Michael Picanzo installed a new stop sign near the restaurant. Increased traffic enforcement by the Police Department could make all the difference, Farwell said. “There’s nothing like seeing a cruiser to have someone put the phone down, ease off the accelerator a little, and pay attention to the road,” he said. Janine Brasil, 32, a server at Heidi’s Place for seven years, said the neighborhood around the restaurant might be seeing more crashes because it’s becoming busier. Fortunately, Heidi’s customers are a loyal bunch. Hurd said he’ll keep coming back, never mind the crashes, because of the connections he’s made with the owners and fellow customers.